Vita Heine defended her title in style with a crushing time in Trondheim. 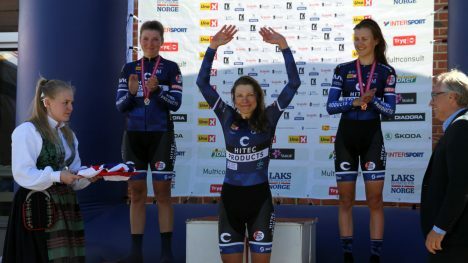 Thea Thorsen took her first UCI-podium by coming second, while Katrine Aalerud took the last podium spot. Cecilie had to settle for a dissapointing 4th on home soil after some sickness. Emilie Moberg took a nice 6th place and Tone a 16th place. Miriam had a puncture and DNF’ed. Anyway a nice start to the week with a full podium.